You have been playing since early childhood. How has it happened that you started perceiving your life through the prism of music? I was very developed child, an all-rounder. Quite early it became clear that I am going to be creative. Being eight years old, I fell in love with the musical instrument piano. It defined the plot of my life. 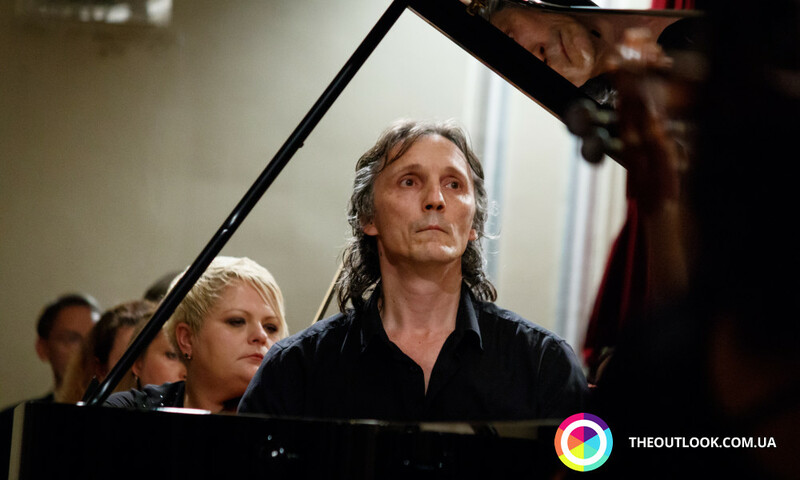 You perform the music of Bach, Brahms, Shuman, Prokofiev, Bartok and Gershwin, but the special place in your repertoire is given to the masterpieces of Ferencz Liszt. You also came to Kyiv to the concert dedicated to his birthday. Your life generally is tightly connected with this personality. Particularly, you studied in Conservatory named after Liszt, got the scholarship of Fund of Cziffra György, the famous piano player who has been famous for the brightest interpretations of the plays of Liszt, won the international contest named after Ferencz Liszt in Budapest. As well, we see some resemblance in your appearance. Do you consider it to be the result of the influence of great maestro creativity made upon you or you feel a deeper connection? It is the happy coincidence, serendipity. Indeed, the key moment of my life is the entering conservatorium. It was a very hard period in my life, but when I found out the music of Ferencz Liszt and his Sonata B-moll, it became my new love that has been lasting till now. For me it was so important to play it right that verily this play made me keep right hand position and appropriate work of fingers, so, it became my play. I did not have another choice. I suppose the moment described as the day when we found out each other. I just could not go in reverse. As we know, you moved to Rome, played the restored royal produced especially for maestro Liszt. What does a person feel when one touches the key-buttons that were touched by the musical genius? I thought it was going to be a traditional concert, and I will come, as usual, in several days to perform. Fortunately, the specialist who was there warned me to come at least five days before the concert because the mechanics of this instrument differs a lot from the traditional one, and it is necessary to get used to it. However, after some practice it was amazing to play. With the help of creativity you fulfill some social projects. For instance, you are the founder of Fund ‘Symphony’, the program that homilizes the principles of musical education for social integration of children living in the poverty. The education idea of ‘Symphony’ harkens back to Venezuela. It means that music is the way to create possibilities and breakthrough. What inspired you to start it within the territory of Hungary? The project works on the modified program that is based on two approaches to musical education. The first is the Method of Zoltan Kodaly invented in Hungary in the middle of X century. The second is Venezuela system El Sistema proposed by Jose Antonio Abreu. We analyzed both directions, defined their difference, filtered and made our own method that is well assimilated in traditional school and classic system of music education. I would like to call it the System of Kodaly 2.0 but to avoid the legal arguments; we decided to give the name Symphony. The essence of the program could be compared with the lesson of physical education in the general education establishments. There not only gifted children-sportsmen take sports who have already got a good physical preparation but also those who can’t do very well or have contra-indications because of health. So, it is not so important for a child to have good musical skills so as to become the participant of our program. Even now we have one fact that is scientifically approved. It claims that music lessons make a positive impact on the human organism in general, we fight for every child to make him remain in this system even if he does not have prominent skills. Which number of program participants are we talking about? How many children have overcome the complete education course? The number of children integrated in the program when we began in 2009-2010 made up 300-400 children. This year 16 schools are participating with the common number of participants of 1400 children. At the moment, we have created the organization system for further increase of the number of schools that take part in the project. Due to our results of former years and concerts arranged with our students, the schools come to ask asking to join our program. Do you have the pupils whom you consider as extraordinary personalities and predict them a great future? There are many pupils who astonish me but I would not like to tell the names, all in due time. Perhaps, every teacher knows it very well that even having the best books and methods, it is better to study when the experience is transferred directly from the teacher to the student. Now I might give lessons up to 5 pupils simultaneously paying equal amount of attention. OUTLOOK usually writes about culture and, certainly, we like to know the expert opinion of the specialists immersed in the particular scope. Could you call the names of musicians who you want to pay attention? For me it could be only one answer, it is my teacher Zoltan Kocsis. Certainly, it is impossible to overestimate the significance of the personality of Kodaly Zoltan and his methods. Your visit to Ukraine is not the first. Are you familiar with the creativity of Ukrainian musicians? Have you found out interesting performers? I came in 2011 and 2016, worked with different orchestras and various musicians. Every time they were magnificent. That’s why I would like to tell that I have only the best recollections. So, I will not call new names because those who work in this area are amazing. I am absolutely amazed that they understand music of Liszt absolutely. Maybe, it could be explained by our closeness. In the course of your visit there will be a workshop in National musical academy named after Chaikovskyy? What will you astonish us with? Is all the workshop based on the plays of Liszt and certain technique or you teach to improvise the themes connected to Liszt? I do not prepare surprises for students, I am waiting for surprises from them because I don’t give a task, and they are cooking up the repertoire from the plays of Ferencz Liszt. I will listen and share my experience and opinion. Certainly, every student will find out his style. If somebody wants to take it from my experience, I will be glad to help. You know, sometimes I appear in the situation of listening to another performer and hear the variations which I love, so, afterwards, I include them in my repertoire. A person who gives so much energy as you do should sometimes relax and restore. Where do you take the inspiration? What is your encouragement? Till I have been able to do it, I will play football. Yesterday in the afternoon I came from Brazil and in the evening played the match, only afterwards I was going to you. It was the serious championship match that is crucially important for me, because my 14-year-old son played in it. You have mentioned your family. Have you given your heritage to your children? I suppose, now not. My daughter belongs to the world of music because she does acrobatics and is twice the champion of the world in this sport. If everything is good, in the beginning of January I will have one more daughter, but it is too early to talk if she has taken the musical career. I don’t want to insist on that. Certainly, if a child is interested in music and shows the interest I will support and help, but will not force.